Vitamins are very important for the better growth and development of the body. If our body does not get the required amount of essential vitamins and minerals, many of the important body functions such as digestion, metabolism, and immunity will gradually collapse. Biotin is one such vitamin that is very important for several functions of the body. Many serious diseases do happen due to lack of this vitamin also known Vitamin B7. In this article, we are going to examine the biotin benefits for our health, hair, skin, and nail. We shall also look at Biotin side effects (pills), daily dosage, and the foods that contain this vitamin. Also, the good benefits of biotin for hair growth indeed deserve to be an important topic we cannot miss out in this post here. Biotin is a water-soluble B-Vitamin also known as coenzyme R, Vitamin B7 or Vitamin H.
This B-Vitamin naturally occurs in many of the common foods that we use in our daily diet. As several of the body functions and growth are closely involved with this vitamin, it is important to maintain healthy biotin level in our body. The benefits of biotin are many as this vitamin is very important for the several functions of the body. It has great importance in the development of skin, hair, nails, nerves and overall growth of the body. It is true that biotin side effects do happen in the case of the overdose consumption of this vitamin in supplement form…however, lack of this vitamin can cause much more havoc to the overall health of the body. It is beneficial to the body as it carries carbon dioxide in the tricarboxylic acid cycle (TCA cycle) which is essential for converting proteins and fats into glucose energy. Vitamin B7 is beneficial in reducing bad cholesterol by promoting healthier metabolism and faster burning of body fats. Does biotin work for hair growth? This is widely debated and discussed the topic among most dermatologists and hair experts. At the outset itself, it must be noted that there is insufficient scientific backing to prove the effectiveness of biotin for hair growth. However, this vitamin being such an important vitamin in helping several body functions and overall growth, there is a strong link between biotin and hair. It is important to understand that hair growth depends on combinations of vitamins and minerals. Biotin or Vitamin B7 is one of the vitamins required by the hair of its growth and strength. Deficiency in biotin is one of the reasons for thinning and breakage of hair. It essentially means that all hair loss instances and stunted hair growth not always due to lack of biotin. Intake of Vitamins B7 rich foods or supplements is a good way to help your hairs to grow better. It is true that people who take alcohol tend to lose more hair than other…because alcohol directly interferes with the effects of biotin. If you are suffering from excessive hair fall or breakage, it is good to do a clinical test to find the biotin levels in your body. If test results indicate low levels of biotin in your body, then you can assume that biotin deficiency is one of the reasons that have made your hair weaker and highly prone to breakage. It is only the continuous growth of hair will make your hair long. It is good to eat the natural foods that contain biotin and other vitamins such as Vitamin A, E, D, and minerals like iron, zinc, and potassium to make your hair grow healthy and long. It is also good to take prenatal vitamins to avoid the hair loss issues usually experienced by women during the pregnancy period and also for the healthy development of the fetus. Biotin for hair growth works as this B-Vitamin improves the growth and strength of the hair. One of the sincere concerns of supplements users is the biotin side effects. It is excellent to learn about the side effects of Vitamins B7 overdose before you start taking the supplement to boost it. Biotin is a naturally included vitamin in most common foods that we consume. If you already have a healthy and balanced daily diet, there is hardly any need to go for additional boost unless your doctor recommends it. Biotin is LIKELY SAFE to consume as most people won’t be affected by any adverse health effects from it. It is a water-soluble Vitamin…such vitamins typically will NOT be absorbed by the body in more than the required amount. Most of it will be expelled from the body through urination. In every healthy person, the body has the natural capacity to tolerate biotin supplements. It is also found that the injections containing Vitamins B7 are also SAFE for health provided the dosage does not exceed the clinically permissible amount. During pregnancy and breastfeeding, biotin supplements should not be taken without the recommendations of the physician. The extra amount of biotin in the body is found to increase your risk of developing cystic acne on the chin and jawline. In such cases, the acne will naturally fade away few weeks after you stop taking the biotin pill or supplement. An overdose of any vitamin or mineral in supplement form is sure to have adverse effects on health in the long run. In adults the daily intake of biotin should not exceed 2500 mcg….drinking lot water is a natural remedy to reduce the side effects of vitamin overdose. Allergic reactions are possible in persons who are normally sensitive to supplements and medicines. It is found people who have allergies with B12 vitamins are quite possible to face the same with biotin pills too. In the case of allergic reactions like nausea, itchy rashes, pain in stomach or chest, etc., should immediately consult a competent doctor. Increased chance of miscarriage is a side effect of biotin when it is taken in a higher dose than the permissible amount. It also risks the health of the fetus… never take any supplements or medicines during pregnancy without the recommendation of the physician. The interactive issue with other medicines is one of the known biotin side effects. The vitamins B7 supplement can adversely interact with medications used for epilepsy, cholesterol, etc. making those medicines work less effectively. Blood glucose levels may affect adversely with the intake of biotin. Normally Vitamin B7 is useful for improving the blood sugar to a balanced level, but taking biotin supplements and diabetes medicines at the same time can bring down the sugar levels lower than the optimum level. Biotin side effects can occur in person under heavy medication as their system may not respond positively to the additional biotin intake. It may also interact with other medicines that may give rise to unexpected physical discomforts. Mostly biotin does not cause any side effects on health and can be consumed by any normally healthy person. However, persons with a history of reactions to supplements may experience side effects with Vitamins B7 pills too. There are also health conditions wherein a person necessarily need to take biotin pills or supplements. For example, peoples undergoing kidney dialysis requires extra biotin intake. Biotin is a common vitamin found in most of the common food items in our diet. 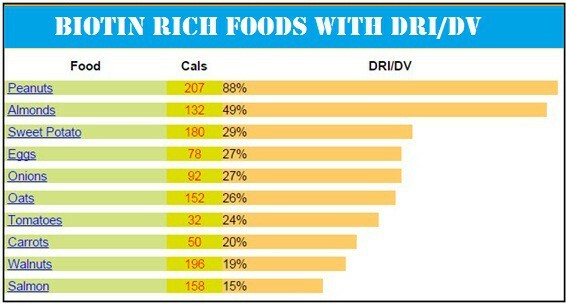 Here is another chart showing best foods that contain good quality biotin with DRI distribution. With recent studies revealing the importance of biotin for hair growth, many shampoo manufacturers have come out with biotin shampoo and hair creams that promise improved hair growth and protection. However, the results of the shampoos with biotin for the growth of hair are not known. It is obvious that Vitamins work effectively from within the body than from external application of it. Biotin pills or supplements are usually taken by people on the recommendation of the physician. It is not at all advisable that you start consuming biotin pills on your own for the sake of hair growth or diabetes control. It is good to have clinical tests done to analyze the biotin levels in your body before you start consuming them. You need to take biotin pills only if severe Vitamin B7 deficiency exists, that too if recommended by the physician. In most cases, you overcome the Vitamins B7 deficiency by consuming the natural foods that contain this vitamin; biotin supplements are not really needed. In all normally healthy persons, the body also has the efficiency to recycle the used biotins in the case of deficiency. Any person on healthy diets will hardly face biotin deficiency. Mostly the biotin pills supplements are required by a pregnant woman as they could face the lack of Vitamins B7 or patients undergoing kidney dialysis. In some case, physicians suggest biotin supplements for persons undergoing treatments for diabetes and cholesterol. The natural food we eat is the healthiest source of all vitamins and minerals. You need to think of supplements only if your food does not meet the bodily requirements of all vitamins and minerals. Biotin side effects usually occur because of the overdose of this vitamin in pills or supplements. The right dose of biotin intake depends on the age of the person and the current biotin levels in the body. However, there is no scientific study that says the exact dose of biotin to be taken. Common recommendations only suggest that biotin intake beyond certain doses will be dangerous to health. Biotin is an essential vitamin required overall health of the body. It is well known for its benefits in hair growth and the development of beautiful nails. The body also needs this vitamin for better metabolism of carbohydrates and fats. It is good to consume natural foods that contain this vitamin in natural form than taking the biotin pill. I wasn’t aware that a deficiency in biotin could lead to hair breakage and hair loss. My mom has been experiencing those symptoms lately, and she may be in need of biotin to help her out! I’ve heard that biotin, too, can help reduce stress. My mom is in need of stress relief, too, so we will maybe give this a try! Hello Amenda, I too share your pain. You might require a thorough medical examination. Usually, a small section of the scalp (about 4 mm diameter) is extracted and examines the microscope to help to determine the cause of hair loss. Another practiced method to identify the hair loss cause is: Hair Pull – the doctor gently pulls out a small amount of hair 50 to 100 strands to discover whether there is an excessive hair fall. There could also be a hormonal reason that is causing hair fall or side effects of some medicines or foods or lack of vitamins like Biotin. Anyways, do not panic..do not try all kind of medication or do a hair-treatment without discovering the exact reason for your hair fall. Hi Albert…Thanks. I cannot afford to go for such an expensive treatment. Hi Amanda, you can try the Viviscal Maximum Strength oral supplement. This might work for promoting hair growth. In addition to this supplement, you could eat foods like animal liver, eggs, marine products and nuts which contain a lot of biotin. One of the recent studies (appeared in The Journal Of Clinical And Aesthetic Dermatology) on Vivisical reported the effectiveness of this supplement in improved hair growth. Viviscal contains AminoMar C™ marine complex, a proprietary blend of shark and mollusk powder, an organic form of silica derived from Equisetum sp. (horsetail), vitamin C derived from Malpighia emarginata (acerola cherry), microcrystalline cellulose (E460), natural orange flavor, magnesium stearate, hypromellose, and glycerol. The study group consisted of a healthy woman between the ages of 25-75 years with Fitzpatrick I to IV photo skin types with self-perceived thinning hair. Subjects were randomized to treatment with the study medication or placebo twice daily for 180 days. The results of this study showed a significant increase in hair growth in subjects treated with Viviscal supplement over the placebo. The hair growth improvements were perceived in overall hair volume, scalp coverage, and thickness of hair body after 90 days (Table 3). Additional improvements after 180 days included hair shine, skin moisture retention, and skin smoothness. Please note, I am not promoting Viviscal supplement but just trying to help you with possible solutions for your hair fall issues. However, I do not guarantee that this product will work for you. Biotin is an essential vitamin that required for the maintenance of health skin and hair. Hi Mathieus..Thanks for your suggestion on using Viviscal. Unfortunately, this product is not available in my place in Mauritius. Currently, I’m using Hair Growth Vitamins Supplement – 5000mcg of Biotin & DHT Blocker for Hair Loss and Baldness. I’m also doing coconut oil and Argan oil treatment. Getting satisfactory results so far!!!! This is a pilot study and does not seem to be a published peer reviewed study. No guaranteed result. Why don’t you try to take biotin for 2 months? It should solve your problem, if your hair fall is caused by lack of hair vitamins. The Vitamin H (Biotin) is a very little known nutrient to most people. I used to see a lot of Biotin supplements Ads..but never figured out its importance. Thanks for the detailed article, great information. It is same with me also. Now I have decided have foods with biotin compulsorily in my family’s daily diet plan. Hi Liz..Good post on Biotin. Biotin is important for the growth and sustenance of healthy hair and nails. However, contrary to the common recommendation for hair growth, there isn’t any need for taking biotin supplements. Studies on Biotin says that there is hardly a very few who might suffer from its deficiency. It is enough to eat the foods that have biotin in them; thankfully, most of the foods we eat have at least a little amount of biotin in them. Here are a few of the basics facts on biotin that is worth understanding. Biotin or Vitamin H is a part of the B-Complex group of vitamins. B vitamins are essential for the body for converting carbohydrate into glucose which is needed for producing energy required for the functioning of body. B-Complex vitamins are necessary for the good health of eyes, hair, skin, liver and nails. Our nervous system would become weak if the foods that we eat do not have sufficient amount of B-Complex vitamins in them. Biotin is crucial for metabolizing fats, amino acids and carbohydrates, the building blocks of protein. Lack of biotin weakens hair and nails. Biotin is a commonly used ingredient in cosmetic products for skin and hair. This vitamin is necessary for normal embryonic growth and making it a critically essential Vitamin especially during the period of pregnancy. Most vivid symptoms of biotin deficiency are unusual hair loss, cracking on the corners of mouth, dray scaly skin, swollen tongue, dry eyes, fatigue, loss of appetite, fatigue, depression and insomnia. SHOULD YOU TAKE BIOTIN SUPPLEMENTS? I would say “NO”. It is just enough to eat a verity of foods as part of our day today diet. It is a water soluble vitamin which is not stored by the body, however, bacteria in the intestine has the capacity to make biotin according to the needs of the body. A few people could experience biotin deficiency because of consuming parenteral nutrition for a long period of time. Those taking antiseizure medication or antibiotics long-term, and people with conditions like Crohn’s disease adversealy affects the digestive system and it becomes hard to absorb nutrients, are more likely to be deficient in biotin. There are no detailed studies that are done to define and give a definite method to assess the lack of biotin in the body. Also, there is no evidence that suggest consuming biotin supplements will improve the health of nail and growth of hair. There are several hair loss medications that primarily contain biotin, combined with zinc and topical clobetasol propionate. It is one of the popular treatments to combat alopecia areata in both children and adults. PLEASE NOTE: If you wish to take biotin supplement for hair growth, it should be take under the supervision of your doctor. Biotin can cause potential side effects when it comes in interaction with prescription medicines that you might be taking already. Nevertheless, biotin by itself is not associated any types of known side effects by itself. Even taking a higher dose of biotin beyond the prescribed amount is not to known to cause any toxic effect on body. Hello Jenni..I perfectly agree with you. Thanks for the added info. Nice to read this article. I have personally experienced the benefits of Biotin, and I regularly take since 3 years. I started with 10,000mcg, but it was too much for me. The I’ve switched over to 5000mcg as my pharmacy friend advised me. My hair has become really thick now. It has made my nails strong and healthy. Now I am happy; three years back I was greatly depressed over the thin hair I had. I am more energetic and healthy now than before, and I do not know if biotin has anything to do with it. This product is really worth. Nice to hear of the good benefits you got from Biotin. I’ll surely have biotin supplement as I am experiencing an unusual amount of hair fall these days. Hi Habib.. Wow!!! That’s great to learn. I have just begun to use this 1 month ago….but occasionally I get a strong itchy sensation on the scalp. Not seen any big difference so far. Hoping to get some good results soon. I am a regular user of Biotin since two years. I am happy with its effects as it has made my hair and nails strong and longer. Before I used this supplement, my hair was thin and scarce. Currently, my hair is very thick and lustrous. My nails used to quite brittle, but now they have become; I prefer to keep my nails well trimmed and polished. Hi Pams….Yes, it works but not for all. All depends on the actual cause of the hair fall. Thanks a lot for your opinion. I was taking biotin pill for a couple of months. But I began to get red scaly rash around the eyes and nose. My physician advised me to discontinue the pills…and the rashes disappeared within two weeks. Now I prefer to have biotin rich foods instead of pill supplements.